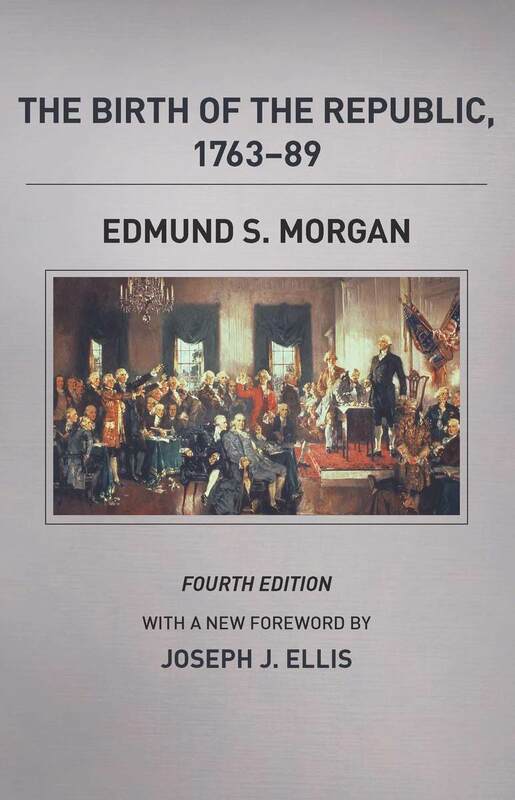 In line with Matt Karp’s look back on Eric Hobsbawm’s Age of Revolution from last month, I’d like to take this opportunity to reconsider a classic work in early American history, Edmund Morgan’s The Birth of the Republic, 1763-89, which has just recently made it to its fourth edition. I have a long relationship with this slim volume. For many years before I began my undergraduate work as a 30-year old non-trad, I had been reading early American history, particularly classic works in the historiography, which has fascinated me since the beginning. I spent years going through the New York and Brooklyn Public Libraries’ 970 shelves and one of the earliest books I read was Birth of the Republic. A decade later, I am now extremely fortunate to be doing my doctoral work at Yale University, where Morgan taught and worked for three decades. Though he has long since retired into reclusion (having just turned 97 last month), he still casts a large shadow over the department. Graduate students here (myself included) whisper about a rare Morgan sighting and get excited when they find one of his books at a book sale with his name (and/or marginalia) written in it. So I very much appreciate this opportunity to return to and reassess this work. First published in 1956, Birth of the Republic has gone through four editions, with the latest coming just last month. How many early American history books from the 1950s can say that? It is a rare thing for a work of historical scholarship to last so long. One can speculate as to why this 150-page telling of the American Revolution has endured. First, like all of Morgan’s work, it is beautifully written with an elegant simplicity that avoids simplification. His writing style so struck me that, as an undergrad, after reading an interview he gave in which he attributed it to his having studied Latin, I decided to begin taking Latin. (I’m still not sure whether to thank or curse him for that). Second, it is an undeniably Whiggish account of the American Revolution, which will seemingly never go out of style for the general public. Both of these things means that, despite making a serious historiographical argument, it is the book’s accessibility to a broad range of readers that has kept it on booksellers’ shelves for over half a century. Historiographically speaking, Birth of the Republic summarizes an approach and argument Morgan had made previously in his even more important monograph, The Stamp Act Crisis: Prologue to Revolution. For nearly half a century at that point, the Progressive interpretation of Charles Beard and Carl Becker, among others, had dominated the interpretation of the Revolution, focusing on class conflict. But by the 1950s that interpretation no longer retained the excitement of its earlier days and early American historians, largely beginning with Morgan, began to reconsider the ideas behind the Revolution, which Progressives had written off as merely the elites’ rhetorical smokescreen meant to disguise more base economic and political motivations. Morgan is sometimes referred to as a neo-Whig historian. In his 1950s period, this seems a fair characterization. His interpretation of the Revolution is one that is defined by “the Americans’ search for principles.” During this search for principles, embodied in the arguments against Parliament, Americans chanced upon a “new discovery,” namely “human equality” (66). Most broadly, his story is one of the discovery and application (and, hence, the power) of the notion of equality. Yet, Morgan was mindful of the shortcomings of this notion in practice, acknowledging that the Americans were “not prepared to follow the principle of equality to its logical political conclusion even for adult white males” (94). Morgan’s focus on ideas came from his study of the literature surrounding the Stamp Act crisis. It had generally been the perceived wisdom that, during the imperial crisis, Americans had made a number of different arguments regarding taxation and Parliament (e.g., internal/external taxes, regulatory duties/tax revenue, etc…). Progressives argued that this showed that American rhetoric was largely opportunistic. But Morgan claimed that the Americans did not fundamentally change their argument in this period, an assertion which allowed him to begin to start taking the ideas behind the arguments seriously. (The story of the entire war is told over little more than seven pages). At times he over-generalized, as when he wrote: “During the years of controversy from 1763 to 1776 the colonists studied Locke and Harrington closely” (74). These kinds of lines put Morgan firmly in the Hartzian/consensus camp. Nevertheless, this work—for better or worse—created a historiographical space in which the republican synthesis of the 1960s and 1970s could emerge. Despite his taking issue with the Progressives, in re-reading the work, the importance of political economy to Morgan’s narrative stands out. In addition to the taxes and duties themselves, he gives great weight to the reactions against the customs boards and the East India Company’s monopoly. I was also struck by Morgan’s view of American nationalism, which—though it is political rather than cultural—takes a long-term view in arguing that it began in the 1760s with the Stamp Act Congress. Overall, the book is a great reminder that our current understanding of the causes of the American Revolution, which began with Morgan and culminated with the republican synthesis, are about half a century old. Focus in the last few decades has shifted to the early republic and even our cultural and economic understandings of the coming of the Revolution (e.g., Murrin, Breen, etc…) are largely decades old. Despite Jack Rakove’s assertions to the contrary, I do not believe that the issue of the causes of the Revolution is settled for good. This new edition from the University of Chicago Press, like previous editions, retains the distinctive and attractive vintage typesetting of the original and adds both a brief foreword by Joseph Ellis, one of Morgan’s former students, and a highly useful 16-page essay at the end by Rosemarie Zagarri entitled “Scholarship on the American Revolution since The Birth of the Republic, 1763-89.” As one would expect, Zagarri deftly summarizes important developments in eighteenth-century race, class, and gender studies from the 1960s on. The inclusion of that essay enhances the book as a whole, especially in terms of its usefulness for undergraduate teaching. Its accessibility and directness should allow for the development of a number of conversations to emerge in that setting. Zagarri closes her essay by referring to the work as a “scholarly masterpiece.” Stylistically it has much from which junior (and many senior) historians could learn. And, though it doesn’t tell the whole story of the American Revolution, it does tell an important part of it and it tells it well. Like all good history should. Jack N. Rakove, “An Agenda for Early American History,” in Recent Themes in Early American History, ed. Donald A. Yerxa (Columbia: University of South Carolina Press, 2008), 38-9. This is really quite an excellent overview, Michael. I honesty don’t have much to say, except that I am now considering grabbing this new edition for my own reference use. My library is sorely lacking in some of these 1950s historiographical classics. Thanks Roy! I wanted to do more of a reconsideration but it’s just so removed from anything being done today that it would’ve taken much more time than I had for a blog post to really dig deep enough to be able to do more of that. Instead, I decided to really try to place it in its original context and try to get through to what made it important in its time and a classic subsequently. That said, I think there is a follow-up post to be done on the question of the historiographical situation in which we find ourselves regarding the causes of the Revolution. I really enjoy these look backs at the classics and where they fit into the development of our understanding of the period, how well they hold up, etc. I’d love to see one on Merrill Jensen’s The Founding of A Nation. Congrats on getting that David Levine portrait in there!